An old friend recently posted a meme online making fun of the “sheeple” who follow social media trends without thinking (ex: the Parisian flag overlay on Facebook following the mass murders on November 13 this year). She said, “No offense to any of my friends who use these, I honor your place in the journey, but this is funny to me because of my place in the journey!” She could laugh about it because she was on “HER journey”. While I don’t normally participate in many of these social media trends (I think I did once in 2014), I felt as if it was rather bullyish to call out the people who, in their own way, are standing with each other on a certain issue (no matter how fleeting, before the next big trend comes along). I told her she wasn’t being nice, and it seemed like she was bullying. She retorted that it was a joke, and I suffered from cognitive dissonance. She explained that in fact, I was the bully for putting her on social media blast with my comment that she was a bully. She went on to say that it was obvious she’d “struck a nerve”. The funny thing is, I didn’t think I was personally offended, or nerve-struck. I, being the Libra I am, wanted to be offended for everybody SHE was offending (because, as stated, I’m not very trendy). Now sit back and think about it. How inane is all of this? What kind of drama had I started because I couldn’t NOT write something in my (perceived) defense of others? Wait a minute. Are we talking about HER ego or MINE? After this realization tumbled down on my head like a ton of bricks, I decided to stop responding to the comments on her post. Because, at the end of the day, at the end of this life, at the end of the universe, it doesn’t really matter. No soul, no spark of life, should fall into the trap that a moment so removed from specialness should be considered significant in the Grand Scheme. I say this with the least nihilistic intention. To add to the balloon-like squeal of my deflating ego, I realized an incredible hypocrisy (or cognitive dissonance) on my part. Go figure. Just before I commented on her picture, I had posted an article on teaching emotional coping skills in the public school system as a way to help kids learn to reason through situations which could elicit knee-jerk or violent responses. 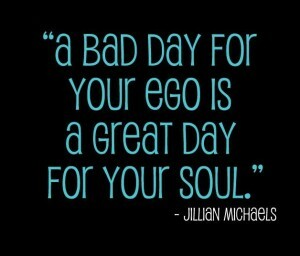 Lesson learned, and ego checked! After writing this, I went to her page and publicly apologized, explaining that she was more important to me than my ego. Am I feeding my ego by sharing this story? I don’t think so. I find sharing my mistakes a fair penance for my projected dissatisfaction. Maybe somebody else will read this before they feel a need to type a comment on something that, 11 seconds later, just doesn’t really matter. better than you, bullying, comment bully, ego, enlightened, online bully, think before you speak, think before you type. Bookmark.